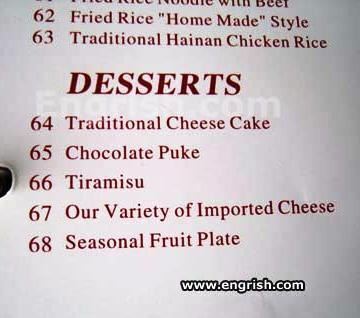 10 Menu Mistakes that will Crack You Up! Want to share the silliness? Tweet or Stumble this article! Ever sniggered at a translation blunder on a sign or instruction manual? 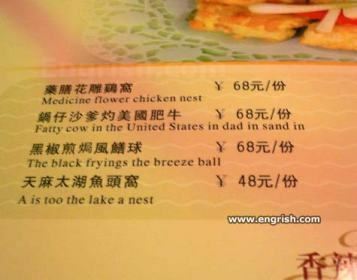 Check out these hilarious menu blunders that will make you think twice about what you’re eating…and the benefits of spell-check! When traveling abroad, I always marvel at the many creative interpretations of the English language. Room Service Menu at the White Swan Hotel in Guangzhou, China. Chinese flea market in Atlanta, Georgia. 4. Teach Your Poultry a Lesson! 5. Cannibalism on the Side? 7. What’s My Dad Been up to?! 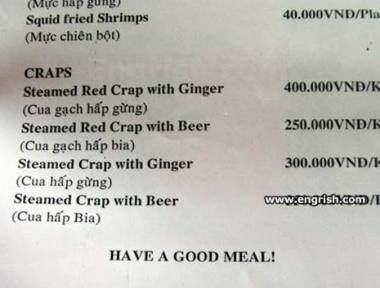 Menu found in Shenzhen, China. 10. 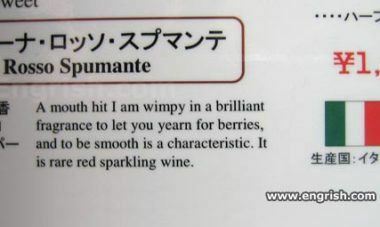 On a Second Thought, I’ll Choose the Merlot..
Got more hilarious translation blunders? Post up your comments below, we want a laugh! Coming soon… street signs to put a smile on your face. Don’t miss out! Sign up for FREE updates via RSS or email below. Chocolate puke is the best, brilliant! wow.. this is a great list! nice one! This is hilarious…I agree with TravelingDan, “chocolate puke” may be the biggest blunder on this list. Love the photos! 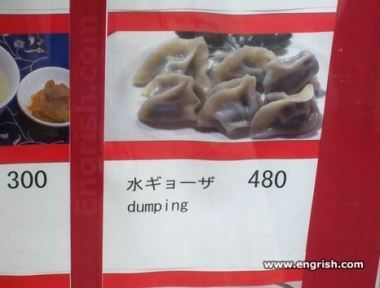 Although I don’t have a lot of strange menu items, I have my fair share of Asian signs that don’t quite make the cut in English. I laughed until I cried . . . Manuel thought I had lost it. This is hilarious!!! I laughed out loud :D Thanks for making this list. Teach your poultry a lesson is my favorite! Glad you liked them, everytime I look at this post I laugh out loud!! This from the restaurant where I work. Owner asked me to proof New Years Eve menu 10 min prior to opening…Told her I didnt like everything Chef made either but this was a bit harsh..1st appetizer listed….CRAP DIP. Servers arent that great with spelling either..from our hand written specials board…SPIT PEA SOUP….SPLIT PEE SOUP…. That’s so funny! 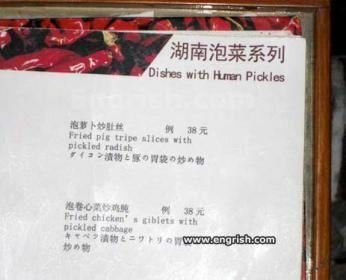 Don’t ask what human “pickles” are. I was in Rome, Italy and had a hard time passing by the eggs. Great laugh!! I think getting a rude chicken is better than a crap, sweat, or puke! Once, back in 1986, on a menu in Puerto Escondido, Mexico, I saw, instead of breakfast, “dreadfast”! On the same menu, for breaded shrimp, it read, “shroempl in bwed cwumbles”! Hysterical. 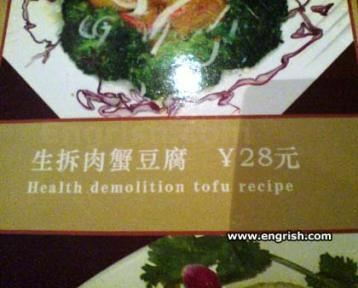 I love the way that words get lost on translation. 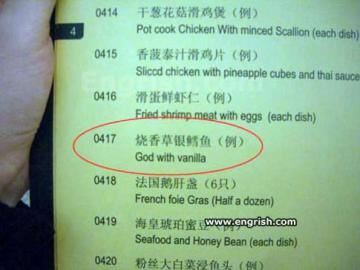 The fun of using online translation sites to make a menu! Imagining sweat and sour chicken just puts me off eating it.. hehe!! My favourite is ‘Fried Rice with Cambodian’ which I had to taste in Battambang, luckily it wasn’t what it said on the tin! This wasn’t a mistranslation as such and I think you had to be there but we went to Spain once and were ushered into a restaurant by a guy who claimed that they made their own potatoes. Obviously, we knew what he meant and his English was much better than my Spanish ever will be but it does go to show how easily meaning can be lost. It’s probably a good idea to enlist the services of a translation company if you want to be sure that you don’t end up with one of these howlers on your documents. Should be Dessert, with an extra “s”! Foiled by the spell check villain. Funny stuff. #9 picture kind of looks like a dumping. Great list! I find errors like that sometimes make the experience feel that much more authentic :). Love it! Cracked me up – just what I needed after a long day at work! 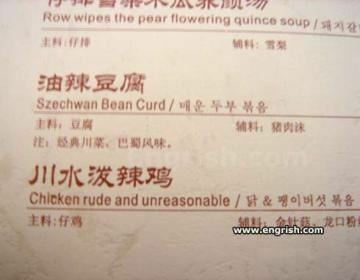 Yes, those Chinese menu translations are a riot! I have been to China twice and have some rare goodies in menus and hair salons. If I can ever find them again, I will send them along! Brilliant love it .. I live in Spain and one of the best ones I have seen is: pork itching hair …. and nope i really don´t know what that was. A take away in Hucknall offered `May Deep` on the menu. Okay….stable enough to type. Eyes are still teary but it’s all good. It was a great laugh. Thanks . Go to any Chinese restaurant and you will find things that can’t be printed here. You would think the Chinaman would have an English speaking friend, and ask: Does this look “light” to you?